First Ascent Youth Leadership combines outdoor challenges with a unique leadership curriculum. At a 2016 First Ascent team-building exercise at Colorado Mountain College Leadville’s ropes course, students balance on two-by-fours. Maggie Friemel, in pink T-shirt, and Spencer Ellsperman, far right, attempt to position a third board for the team to stand on. This year, students will attend the youth leadership program July 8-13. Applications are due in April. 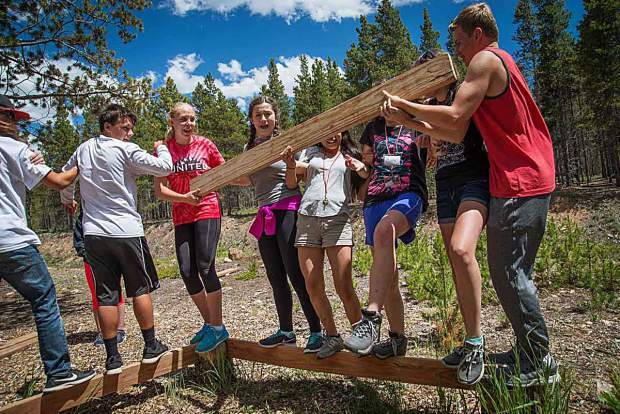 The First Ascent Youth Leadership program is now accepting applications for its free, weeklong course at Colorado Mountain College’s campus in Leadville. This outdoor experiential course is now in its 23rd year, and is for students entering ninth and tenth grade in the fall of 2018. Dates this year run from Sunday, July 8, through Friday, July 13. The program is available to students living in the six counties of the Colorado Mountain College district: Eagle, Garfield, Lake, Pitkin, Summit and part of Routt. Recommendations from a counselor, teacher or other adult are due at the end of April. To be considered for this summer’s program, by April 13 applicants must submit the name and email address of the person who will recommend them. First Ascent teaches leadership, problem solving, consensus building, conflict resolution and communication. During the weeklong program, students live at Colorado Mountain College’s residential hall in Leadville, and build self-esteem through challenges such as rock climbing, summiting Mount Elbert and rafting the Arkansas River. This year, the program will accept 35 successful students who show potential to be leaders. Counselors and staff are graduates of the program; students completing First Ascent can return to work as staff during future summers. For more information and to apply contact First Ascent’s program director, Katia Curbelo-Del Valle, at 970-947-8357 or outreach@coloradomtn.edu.